Here we have an uncle and his little nephew. This uncle is pretty much the coolest uncle in Cache Valley. 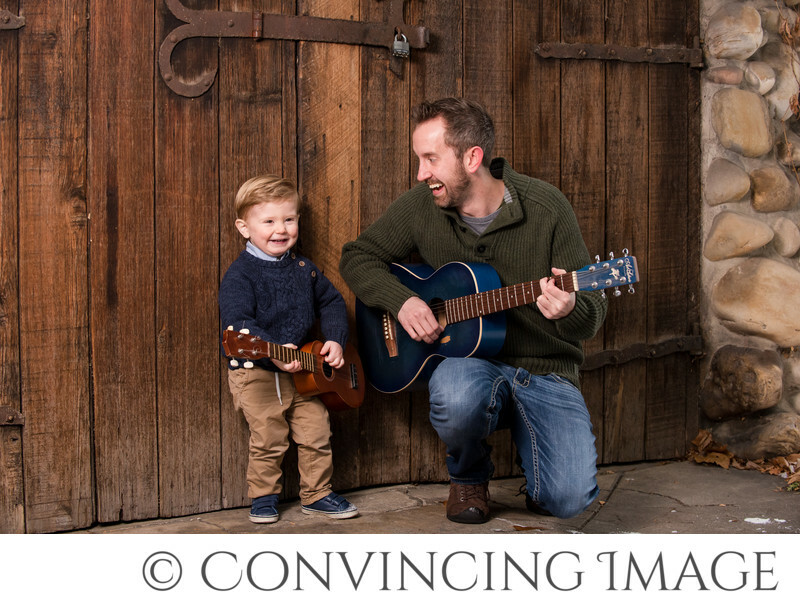 He showed off his guitar playing skills during the extended family session we photographed. Well, if he's going to show us how the guitar playing thing goes, his little buddy nephew should too! What a lucky little guy... with his uncle working at a local guitar shop, he has access to some of the best guitars this valley has to offer. The little guitar he's holding is, in fact, his. He's starting early learning his own set of strumming skills. With all that said, why can't you incorporate your likes, interests and personality into an extended family session? Sure, maybe it's often just about getting the shot of everyone there, but if you can find a way to share what you love and why you love it during your session, you will love your photos that much more. What is it that makes your family smile? What color do you all often find yourself wearing? Is there a location that you and your clan often seem to find yourself drifting to? Let's go there. Let's make your session more fun by showing who YOU are! Keywords: Logan Family Photographers (3), Utah Family Photography (3).